This lovely scrollwork design was inspired by Bach’s Toccata and Fugue in D Minor. 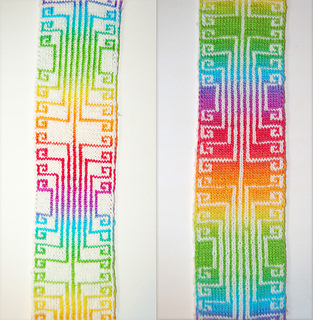 Endless Violins is a motif worked over 29 stitches and 64 rows. It makes a beautiful and warm double knit scarf with approximately 600 yds of worsted weight yarn (300 each color), or it could be used as a colorwork panel insertion for sweaters, skirts, blankets, or anything else a knitterly imagination can conjure. 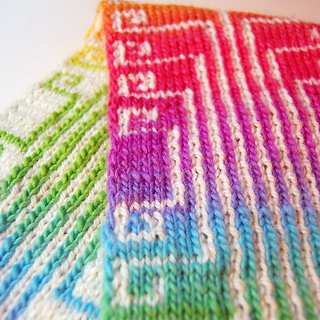 The pattern is a chart only, it does not contain double knitting instructions.